What is LOST.DIR folder? How can I retrieve my files from lost.dir files with the easiest way? LOST.DIR file folder in Android devices performs like the Recycle Bin on Windows platforms, from which you are allowed to retrieve files like documents and photos. Usually, as you were saving files but suddenly the devices just turned off, or you pulled out the external sd card while the read-write process is carrying on, Android phones or tablets will create the LOST.DIR directory so that the files can be recovered the next time you boot up the device. But it’s not an easy job to recover the lost files from LOST.DIR just like you do from Windows Recycle Bin. Why is that? You’ll have difficulty in finding the specific files that you’re trying to recover, because the files in LOST.DIR are named with random numbers instead of the original names as given. To overcome this difficulty, you need the help of a proficient data recovery solution. How to Recover LOST.DIR files from Android Devices? As I’ve said, among all the recoverable files in LOST.DIR directory, you will surely find yourself hard to get started. UFUSoft Data Recovery can well solve this problem as it offers a full recovery of files and folder structure. Just connect the external sd card of your Android phones or tablets with a computer, and download UFUSoft File recovery software. 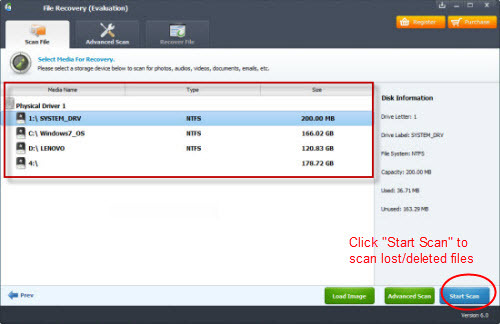 You can perform SD card data recovery and recover LOST.DIR files on external sd card easily all by yourself with the guide below. Step 1: Install UFUSoft File Recovery on your Windows PC. Connect your Android device in mass storage mode and launch the installed software. Select “Recover Lost files” option from main screen. Step 2: From next screen select drive of your Android device and click “Next” to begin scanning process. Step3. After the scan, you can preview all the listed recoverable files in LOST.DIR directory and choose those you want to recover .DIR files.